Vietnam is one of the major emerging markets of the ASEAN region and one of the underpinnings of this growth has been the expansion in telecommunication networks. Over the past five years, Vietnam has sustained an average fixed line network growth of 26.8 per cent, slightly ahead of China and one of the highest in the region. While the country’s domestic fixed-line network has grown rapidly, mobile communications developments are less impressive. Despite the fact that mobile services were introduced in 1992, and even though it is one of the first parts of the sector where competition and private sector participation has been allowed, Vietnam has one of the lowest ratios of mobile to fixed line subscribers in South East Asia. The government has attempted to reconcile the essentially free-market character of the Internet with a national system based on state control. Only few countries are protected by a national firewall or apply such tight licensing regulations to the ISP market, which is still largely state-owned in Vietnam. 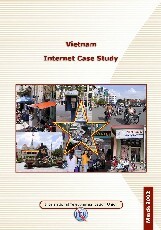 Despite a late start, (the Internet was first permitted in Vietnam in November1997), the dramatic growth that has marked the Internet in other countries is apparent also in Vietnam. During 2000, the number of dial-up Internet subscribers grew from just 42’000 to over 100’000, a growth rate of almost 150 per cent. An ITU mission, including Michael Minges, Tim Kelly, and Lara Srivastava, was carried out in Hanoi and in Ho Chi Minh City from May 14-17. The mission was coordinated with the Vietnam Department General of Posts and Telecommunications (DGPT).